You’d be forgiven for thinking the retro-styled XSR700 and 900 are tame, or they’re staid versions of the MT-07 and MT-09 on which they are based. But that would be ageism. At heart, those MT bikes are adolescent reprobates: they hike wheels fore and aft with the same reckless abandon that a rebellious teen hikes a middle finger. 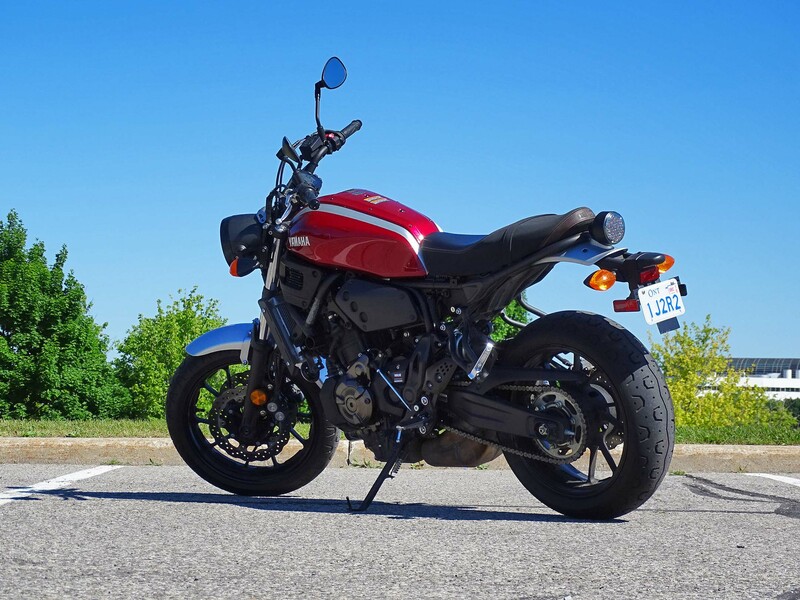 When I rode the XSR900 – based on the MT-09 – I said it was a gentleman’s toy: the sort of bike perfect for an accountant with a secret stunting streak. 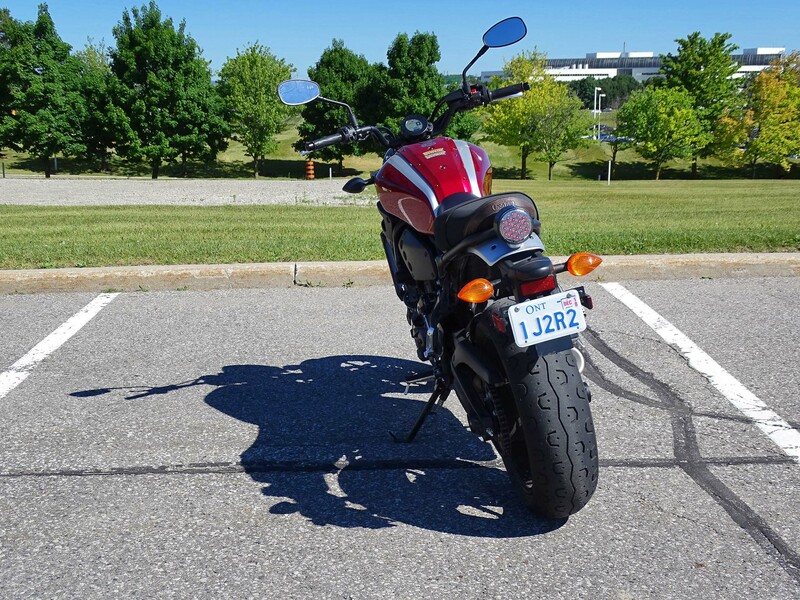 It looks big from this angle, but the XSR700 is comparatively small and nimble. 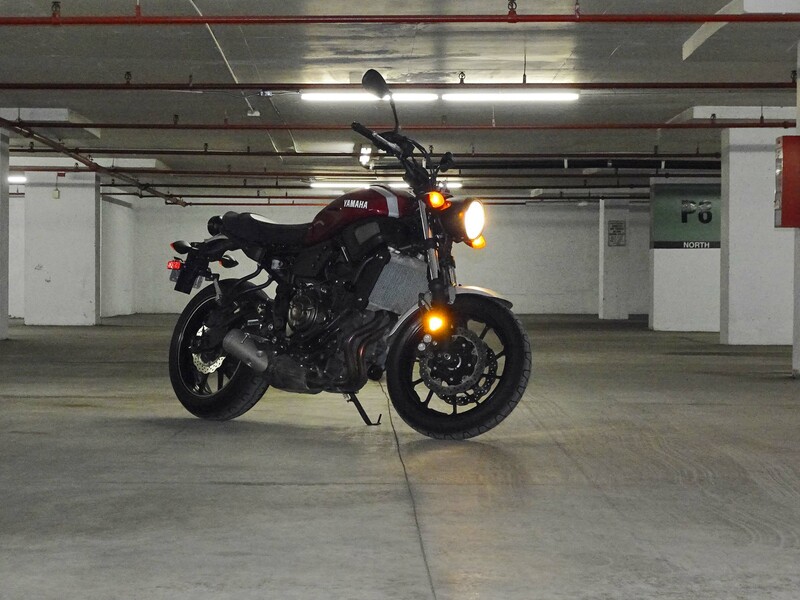 The XSR700 is in a similar vein, just in a smaller package. A smaller, nimbler, easier to ride package. It, too, is based on the MT platform, though this time the -07, not the -09. This bike packs more character in its diminutive 1,405 mm wheelbase than you might imagine, and ironically, very little of that character is born of styling. Ironic, because at $9,599 MSRP, you’ll pay $1,300 more for the privilege of riding this “sport heritage” version of the MT-07. In fact, the “retro” styling of the XSR700 is sometimes awkward. It’s similar to a poorly dressed hipster. The round LED taillight doesn’t quite sit right above the fender, the seat doesn’t quite match the lines of the chassis. The key is placed clumsily ahead of the large round instrument cluster; though that is also true of the MT-07. The whole bike looks mildly off-kilter. It lacks aesthetic cohesion. Not quite Jacob’s cup of tea, aesthetically speaking – but then, he likes Vegemite sandwiches. When it comes to road manners and riding style, however, the XSR connects brilliantly. 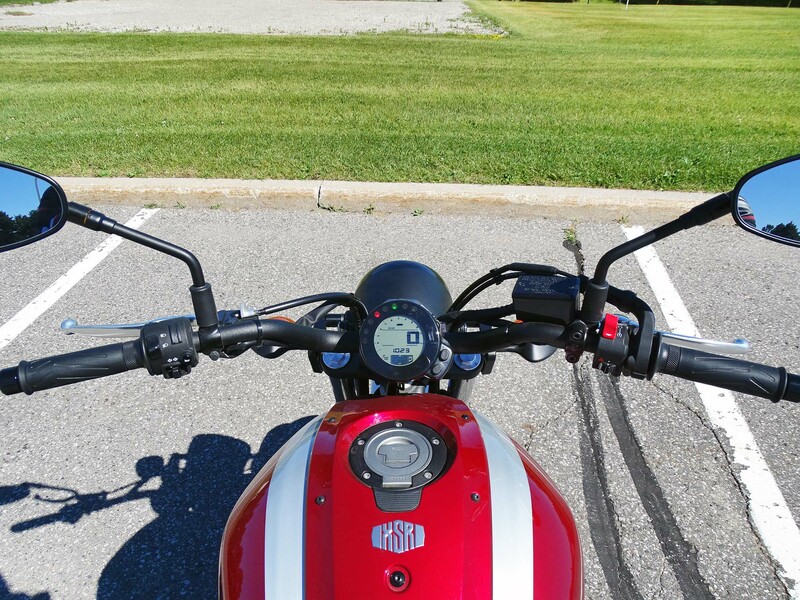 The riding position is mildly aggressive, with your body cocked forward just enough to engage with the bike, your legs up just high enough to exert the right amount of control on the pegs. Even the bars are positioned nearly perfectly, at least for me at 5 foot 6. Somehow, the comparatively high 835-mm seat height was a non-issue, perhaps because most of its 186 kg is placed low, allowing for good low-speed and stationary control. This bike is child’s play to ride, and childlike in its exuberance. It begs you to ride it with a playful spirit, and rewards you when you do. No button-down here. Official stats cite 50 lb-ft of torque at 6,500 rpm from this 689 cc twin, and unofficially 74 hp at 9,000. Yamaha credits the parallel twin’s 270-degree cross-plane crankshaft for the low-to-mid-range torque, and surprising smoothness of this engine. It’s only right up past the 9,000 rpm mark when this unit gets a little fluffy, and even then it feels smooth. The engine loves to work in the mid-range, where the six-speed gearbox is happy to make easy shifts that are unaided by quick shifters or slipper clutches or any other new-fangled device. Instead, this gearbox achieves its ease of use the old-fashioned way: it’s just plain well built. Is this engine on par with the triple found in the larger MT-09 and XSR900? Absolutely not, but the $11,099 XSR900 is not only a lot more expensive but also in a more prohibitive insurance bracket. It’s also not as easy to ride or city friendly as this XSR700 is. The steel backbone frame is a stalwart of the Universal Japanese Motorcycle, and this one makes for a playful companion. Conventional 41-mm forks are appropriate for the retro motif, and equally so for the mission at hand. The front end is seemingly unflappable, accepting divots, bumps and mid-corner throttle with seasoned ease. With only 130 mm of travel available from the horizontally-mounted rear shock, the XSR700 can start to run out of ground clearance when two-up, so it’s important to use the preload adjustors available. Riding solo, the rear end is well-weighted and well-damped. The pathway from throttle to contact patch is unencumbered and the little Yamaha wastes no time turning your desire for momentum into action. Reversing that action are twin, 282-mm front discs gripped by four-piston calipers. Out back, those brakes are supported by a 245-mm wave rotor and a single-piston Nissin caliper. The ABS kicks in too eagerly, which softens the brake lever. Until I realized what was happening, I found the brake feel spongy, but once I learned to back off a little and brake with more finesse I found the brakes had more bite than the lever let on. Having the safety net of ABS on city streets made of tram tracks, detritus and dark matter means a lot for the regular commuter. Again with the low angle. This is what the world looks like when you’re Jacob’s height. If you want the privilege of riding something neo-retro, the Ducati Scrambler is really the next closest competitor to the XSR. Arguably, that bike does a better job of capturing the essence of old-school style. But the real story of the XSR700 is beyond skin deep. It’s about a well executed chassis, a flawless engine, and playful, willing, riding manners. All of which you can access for less money in the same show room, with the MT-07. Oooh – time to scuff up that rear tire! This little yammie rides nice, true. And…the aesthetics and build quality are horrific. My $$s would be better spent on the monster-esque Suzuki SV650…cohesive design, great motor, sweet handling, proven, and with decent build quality. I love the 700. It has an industrial or Mad Max thing going on. I wish I could afford one. Test rode this at a Yamaha Demo. Looks very parts bin and thrown together. Not at all the sought after tribute to the older XS series. Engine and fueling are spot on. Chassis is stiffer and a bit more flickable then the standard MT-07. That being said if you value comfort more then adrenaline the MT-07 is more your ticket. Brakes ? Better then my current Versys 650 ride. The most memorable feature but not worth the extra green backs was the raspy exhaust. No need for aftermarket.